We know how busy you are, but this is very important. We need your help to bring art to the printed page for artists and readers everywhere. Since 1981 New Observations has given artists direct editorial control of magazine publishing for the arts. That’s art from the inside out. Will you take a moment to learn more and help us with the publication? Together, artists have guest edited 128 back issues and today, after a 12 year stop, New Observations Magazine is publishing a 129th issue. Bringing back New Observations Magazine for our community as a full color printed edition is a way of making sure that artists will continue to enrich the printed page in addition to all the electronic screens in our lives. We all want to be part of this history making publication. Start now by donating towards the printing costs and please ask your friends on the social networks and in our everyday lives to help out too. Share this link. After all, finding art on the printed page is as important as finding art everywhere in our lives. Issue #129 Out Of The Box (The Way Of Art On The Loose) is packed with remarkable, rare, unique, cutting edge and archival content from some of our community’s most engaging members. Happy Holidays Everyone And Thanks For The Support! New Observations is a conceptual print magazine published by artists for artists and the greater community, as a work of collaborative art. After 128 back issues from 1981-2001 we are ready to print issue #129, twelve years later, as a limited edition. We need your help to do that. We have put together a remarkable issue with Guest Editor, Joshua Selman. The offset printing of our 129th Issue, “OUT OF THE BOX – The Way of Art On The Loose,” reintroduces the magazine exploring alternative ways that artists have interacted with art making and their communities, bringing together seminal artists from Fluxus, Street Art, Correspondence Art, Contemporary Intermedia, Experimental Utopias and beyond. We are presenting artists who have reacted to social conditions that lack flexibility, by distributing work either for free, or outside of rational transaction, loosening the exchange structures in their communities, through various offerings. We have inside coverage of Lance Fung’s Artlantic Wonder, the five year Art Park being created in Atlantic City and how the first phase, with installations by Robert Barry, Ilya and Emilia Kabakov, John Roloff and Kiki Smith survived hurricane Sandy to open to the community, in just a month of its aftermath. 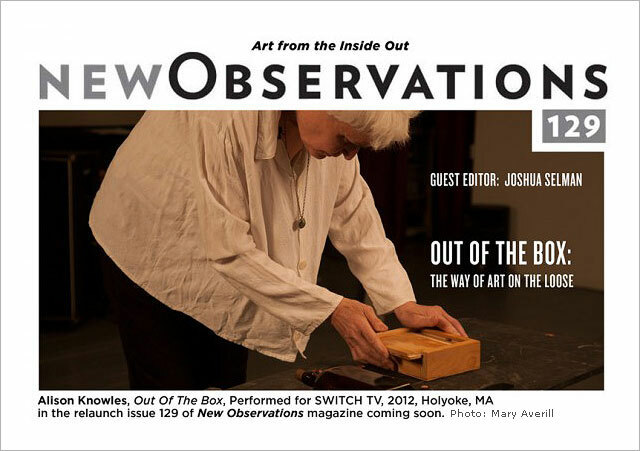 Alison Knowles created a piece for the issue titled “Out of the Box,” that was also performed on SWITCH TV in Holyoke, MA and documented for the magazine. Hannah Higgins has contributed a meditation on Buckminster Fuller. We have a feature section from very rare, never before seen documentation from the Larry Miller Archive that is being guest designed by Sara Seagull. We are also very happy with our New Logo by guest designer, Betsy Brecht. And there is much, much more, promising an exciting and important re-launch. Our Target is $8,000.00. Our priorities for funding are Printing & Distribution Costs. We are printing 64 Full Color Pages with TigerPress of Western Mass! Come to the re-launch event in NYC! The community is invited to celebrate the achievement. As soon as we have the printed edition look for your personal invitation. New Observations LTD is a 501(c)3 non-profit organization dedicated to bringing artists’ voices to the public forum through a guest-edited arts journal founded in 1981. Its editorial program allows for freedom of thought, expression and experimentation, offering artists the opportunity to explore in-depth thematic topics. New Observations is a registered trademark.